Fall Into Fitness Giveaway Hop! Like most of you all, I am so ready for fall! To celebrate cooler temperatures (finally? hopefully? I’m almost afraid to type this! 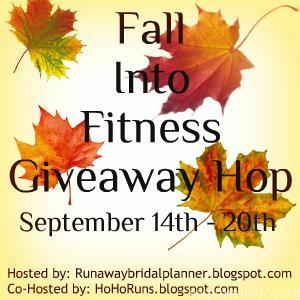 ), I’m joining up with a whole crew of great bloggers (lead by Kristy at Runaway Bridal Planner and HoHoRuns) for the fall into fitness giveaway hop! What’s a giveaway hop, you might ask? Well, simply put, it’s an easy way for you to find some new blog reads and enter to win some awesome prizes! I’m super excited about this because I had a lot of fun when we did this early on this summer. As for me, I’m going to keep it simple and offer up a prize that I’d love to win myself: a $25 Amazon Gift Card. Ideally, you’ll use it to purchase something you need to help get you on track for a healthy fall, but you buy whatever you want with it (no judgment this way). So, how do you win? Easy – check out the entry methods below and remember you can enter every day between now and September 20th. I will post the winner here on September 21st. You can come back and enter every day so I hope you’ll come back and tell your friends. Good luck! Don’t forget to come back every day to up your chances of winning! Tell me, what is your most common Amazon purchase? I most often buy printer toner on Amazon. U buy workout stuff like yoga mats and weights and kitchen gadgets. Oops typo- I buy- I meant to say. I LOVE Amazon. I buy books and books and more books! LOL mostly about run in and fitness. Naturally. 😉 excited to check out this blog hop. Thanks for hosting!! I often buy running books and Morton Epsom Salt Lotion. It helps with my aches and pains. Lately I’ve been buying knitting needles from Amazon – but if I won, I’d buy a new sports bra! I usually buy a lot of crafting items! I make cross-stitch Christmas stockings for my family members, so it’s a great way to buy them since the price is cheaper than in store & the variety and selection are huge! I by many different kinds of things on amazon. I buy household items for the kitchen mostly on Amazon, and I also buy K-cups on Amazon. I buy books the most. I buy so much on Amazon but most often it would be vitamins/supplements. I buy Kindle books and protein powder. I usually buy Christmas presents or toys for my son. I usually buy toys for my grandsons most often on Amazon. Their prices are great and have such a great selection. I LOVE Amazon…I literally buy everything there! Um, I pretty much buy everything from Amazon – ha! As a member of Amazon Prime, it makes sense to take advantage of their super-fast shipping and it’s so easy; of course, I buy tons of books from them, too – Kindle lover! Thanks, Courtney!! I buy a lot of gifts on Amazon, but lately I’ve been stalking Oiselle items for fall (of course). I just got some capris. I kept them in my cart for a week and they went from $37 to 23! I save up amazon gift cards all year to buy Christmas gifts. I buy everything from Amazon! Anything from honeystinger waffles, gels, running equipment, gifts for my family, household products…the list goes on and on! Love that Prime free shipping! I most often buy kitchen gadgets on Amazon. I tend to buy electronics and printer ink from amazon. I also have bought some office supplies. I buy pet supplies the most on Amazon. Gosh, I buy so many different items ranging from electronics, clothing, Kindle Fire & books, kitchen gadgets, etc. I buy toys most often on Amazon. I buy a lot of gluten free items and books. Lately I’ve been buying a lot of baby necessities on Amazon. My most common purchase on Amazon is books. I mostly buy movies on Amazon. I buy tons of books off of Amazon. Always books. I homeschool my kiddos so the books never end! Oh for sure my grandson! Love shopping for him on there! Such a huge selection! Oh, how I love Amazon! I like to buy toiletries and household goods. ‘We buy lots on Amazon! Mostly toys for gifts for family out of state, I also buy my Nuun on Amazon. I’m old-fashioned – I mostly buy books! I but a lot of shoes from Amazon. I buy a lot of jewelry and fitness apparel on amazon. They have everything at really reasonable prices if you’re willing to spend some time looking around for the best deal. I most often buy DVDs and bird food. Books, I buy so many books from Amazon! I buy everything on Amazon, but the items I seem to purchase most are gifts for others! I buy just about everything at Amazon. Printer ink, toiletries, outdoorsy stuff, gadgets, etc. I mostly buy gifts and textbooks for school. I buy books and record albums. I buy random stuff on Amazon, but my favorite thing is books! I most often buy office supplies on AMAZON. I most often buy vitamins for my family on Amazon. I buy lots of random stuff on Amazon including textbooks most recently, womp womp. I guess I mostly buy vitamins though. Hmm. I love amazon becuase you can buy ANYTHING! I normally purchase , book & christmas presents for my kids! Thank you for the chance! I buy books way too frequently on Amazon. For me it’s a tie between books and Frontline for the cats! Every time a kid I know has a birthday….I buy them a toy or an outfit…..and a book. I mostly buy books and cosmetics on Amazon. I buy snacks most often on Amazon! I homeschool my kids so I mostly buy supplies for them. That’s is a very hard question! I love Amazon Prime. I buy Dark Magic coffee pods probably more than anything else. I buy absolutely everything on Amazon! I love buying ebooks (paranormal romance). that’s where I got almost all my school textbooks! I usually buy books for my sons! My amazon orders are a wonderful random you-never-know-whats-next mix. One of my favorite orders included a chainsaw blade, a Lodge double burner griddle and a childrens book. I love amazon for buying all sorts of things. Recently, it’s been quite useful for picking up running accessories that I need. I recently picked up a pair of running shorts from there – and also bought my flip belt through amazon too. It’s so convenient! I buy books and Xbox games on Amazon. I buy a ton of books for me and video games for my son. I buy natural hair products off amazon too! Thanks for linking up with us!!! We mostly buy books and cd’s from amazon. I mostly buy books on amazon! I buy books and varies presents. Running shoes! Also gifts for people. I buy books for my kindle the most. The one-click can be dangerous sometimes. I buy a lot of books from amazon. They have an amazing selection. I buy a lot of clothes and running gear on Amazon. I love books so that is what I buy most on Amazon. books. I have a book buying problem. I but too many Lego sets on amazon! I buy lots of different things from Amazon but I mainly get craft supplies. I mostly buy e-books for my kindle. I usuallu buy books from Amazon. I mostly buy DVD’s , books and PC games at Amazon. We buy almost everything on Amazon. I buy a lot of games on Amazon. I buy books and gifts the most. I mostly buy toys, books and gifts on Amazon. I buy toys for the kids on Amazon. Usually it’s something that involves running! I don’t buy a ton online but I am a always looking for a good deal on a photo light box! Judy @ Chocolaterunsjudy recently posted…I thought I was glass half full, but I’m spilling it! I buy alot of books on amazon. I buy dog treats on Amazon. I buy a lot of things on amazon; from books to face masks, amazon is a great site to shop at. office supplies and board books!! I buy a lot of things at Amazon. I get a lot of grocery items from them anymore. I always buy my essential oils at Amazon.